Want to disable the automatic updates in Google Chrome then read this blog completely and learn how to Disable as well as Enable Google Chrome automatic updates in Chrome. Google Chrome uses two System Services namely Google Update (gupdate) and Google Update (gupdatem) to check for the update. So, in order to turn off automatic update in Google Chrome, you need to disable these Google services. To do this task you can use the System Configuration window. Apply the below-given steps to turn off automatic updates in Google Chrome. Note: After turning off auto-updates your chrome browser may not get the latest security updates automatically. Step 1: First of all close the Google Chrome browser. Step 2: Open run dialogue box by pressing Windows Key + R.
Step 3: In this window type msconfig and press enter. Step 4: System Configuration window will appear, navigate to the Services tab. Step 5: Check the box “Hide All Microsoft Services” present at the bottom. By doing this you can hide all the services associated to Microsoft so that you don’t disable essential services. Step 6: Under the services section search and find Google Update (gupdate) and Google Update (gupdatem). Step 7: Uncheck both the Google Services and click Apply and OK buttons to save changes. Step 8: Now, a message appear that ask whether you want to restart your PC or not then select anything according to your requirement. After applying the above steps to disable automatic updates in Google Chrome, now make sure that these chrome update feature are disabled correctly. Open Google Chrome > click Chrome Menu > Help > About Google Chrome. After it, you will see that the Google Chrome will start checking for the available update. If you receive an error “An error occurred while checking for updates: Update check failed to start (error code 3: 0x800704C7 — system level).” then you have successfully disabled the automatic updates in Google Chrome. You may also like: How companies get your Browsers History and what to do about it! After disabling automatic updates in Google Chrome, chrome browser gets unable to download the necessary updates unless you enable the Google update services. To Enable to Google Chrome Updates, apply the below-given steps. Step 1: Close Google Chrome. 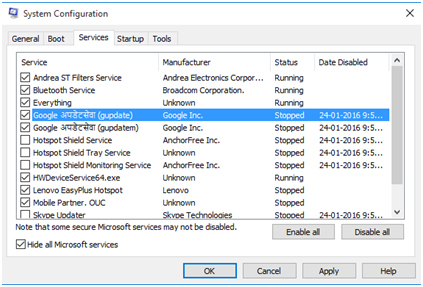 Step 5: After it, find Google Update (gupdate) and Google Update (gupdatem) and check the services. Step 6: Click on the Apply and then on OK button to save the changes. Step 7: Reboot your PC and open Google Chrome. How do I uninstall Chrome updates? Step 1: First of all you have to close all of the Chrome windows and tabs and then go to the Start menu Settings -> then click on the Apps. Step 2: Under the ‘Apps & features’, search for the Google Chrome and then click on it. Step 3: Then click on the Uninstall, confirm the process by clicking on the Uninstall. Step 4: If you want to delete all of your profile data and other information such as bookmarks, history and more then tick ‘Also delete your browsing data’. Step 5: At last, click on the Uninstall. Recommended Scan for your Slow PC! If you want to make your system fast and error free then you should use a professionally designed PC Repair Tool. This application is one of the best and effective ways to maintain your Windows system. This software contains an easy to use interface so that one can easily operate this tool without the need of professional skill. If your computer is displaying any types of error related to registry, DLL, application, Games and more then this error repair tool will help you to fix them. Simply download and install this tool, it will automatically scan your PC/laptop and fix all the errors. This app also provides the facility to fix driver related issue, it can update and fix any error related to the system’s driver. So, it is recommended to use this software and enhance the performance of your old computer. Want to Disable & Enable Automatic Updates in Google Chrome then you can easily do this with the help of given steps one by one.